If you were asked to name Britain's top property hotspot, an exclusive London borough or a thriving second home destination might spring to mind. 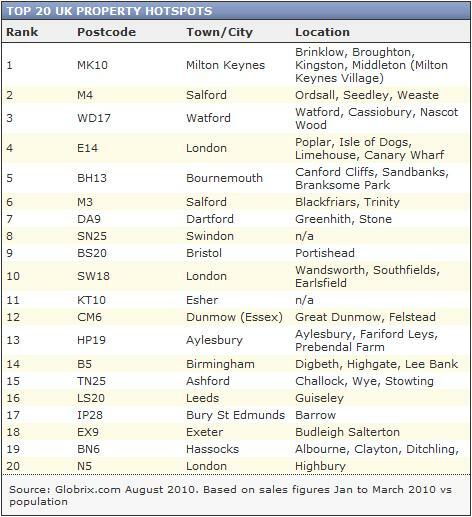 In fact, according to number crunchers at property website Globrix.com, the UK's number one property hotspot is the home of the infamous concrete cows - Milton Keynes. It may be typecast as over-reliant on roundabouts and resembling an over-sized business business park, but the green space and relaxed atmosphere of Milton Keynes is attracting plenty of homebuyers. And that means there has been a higher turnover of properties bought and sold per person in the MK10 postcode than anywhere else in the country. The data used by Globrix looked at Land Registry property sales for the first three months of 2010 and population information to generate a list of property hotspots, revealing not where prices were highest or rising fastest but where people wanted to buy. Attracted by a fast train to London, the number of businesses in the area, and the lifestyle on offer, buyers seem to like Milton Keynes. It was followed by Salford, M3, and Bournemouth, BH13, in the hotspots Premier League. Other members of the top 20 ranged from more run-of-the-mill locations, such as Swindon (SN25) and Ashford (TN25), to posher Esher (KT10) and Highbury, London, (N5). Globrix's Nigel Lewis says: 'These postcodes all have a story behind them and for example M3 (Salford) is where a lot of BBC staff are buying homes currently after Auntie relocated many of its functions from London. The Globrix property hotspots highlight the divided nature of the property market in the UK. Prices in popular areas, or those seen as offering good value, have been buoyant over the past year, after the market hit a recent low in spring 2009. In these areas, agents say cash rich buyers able to raise large deposits have been chasing a shortage of good properties for sale. On the other hand, areas considered less desireable have suffered, with homeowners struggling to sell and buyers thin on the ground. Overall property transactions are still running at a low level, despite the Land Registry reporting prices up more than 8% annually to June. To this extent, Lewis says the top 20 postcodes represent 2% of all house sales in the UK and are areas which, compared to the 2007 peak, have bucked the trend. However, even then the number of properties being bought and sold it still low. 'For example, the number of homes shaping up to be sold in MK10 this year is down by 33% on the market peak while nationally the average is 50% down,' says Lewis. Looks like, if you drop you price, then you 'might' sell your house! Looks like the expensive properties are holding up the average price. If we had a fully functioning market today then would prices be about 25% cheaper?